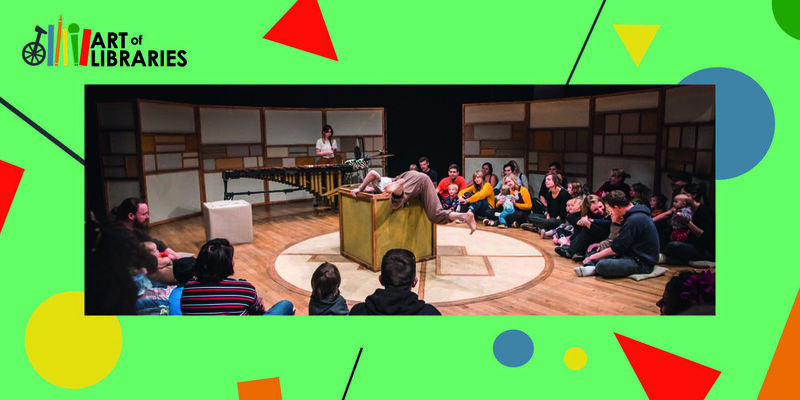 Plink & Boo is a small scale touring circus/theatre performance, aimed at 2-5 year olds and their grown-ups, which explores gender stereotypes in toys and play. We designed the show to suit a variety of types of space, with a flexible circular set which could grow from a 7m diameter up to a 10m diameter and an audience of between 40 and 70 seated predominantly on the floor. In addition, the show has just 3 performers: 1 musician and two physical theatre/circus performers. The company were keen to take the show to less traditional settings such as libraries, in order to reach a much wider audience – particularly those who may never set foot in a theatre or arts centre. This aim resonated strongly with the work being undertaken by both Art of Libraries and by GL4/Strike A Light Festival. As a result, a natural partnership emerged in order to bring the show to Gloucestershire. All partners were keen to use the experience of hosting Plink & Boo to embed the emerging relationship between the Gloucester libraries and GL4/Strike A Light Festivals. We were all aiming for a really positive experience that would ‘deepen the roots’ of GL4/Strike a Light’s programming in the libraries through working closely with the library staff, building their confidence and skills to programme more performance work in the future. Can’t Sit Still is working with a number of libraries throughout Plink & Boo’s national tour in 2018 and had a wonderful start early in the tour in Gloucestershire at Matson Library with the GL4 Festival and Gloucester Library with Strike A Light. Although we are based in Bristol we made a point of rehearsing in Gloucestershire and, with the invaluable support of Louise Bardgett from Create Glos, held an open rehearsal for library staff and Festivals staff a couple of weeks in advance of the show dates. Wherever possible, we would hugely recommend this to any performance company! It gave the library and festivals staff first-hand experience of the show so they could do a great job of promoting it, and gave all of us the opportunity to ask questions and check we understood potential problems and opportunities of working together. The two Glos library venues were both on the smaller side for our show – around 7m diameter - and due to the acrobatics involved it would have been unsafe to perform in a library with less space. For the audience, this meant a very intimate experience and being super close to the performers. For our performers and stage manager it meant that the library performances were very intense: they had to pay significant heed to safety of everyone, manage audience participation on a smaller stage area, and change some of the prop movements to suit the different context. The key to the success of being able to play in smaller spaces lay in the versatility of the set design. As we knew we wanted to take the show to non-traditional venues, the designer had been briefed to create a circular space that could form a ‘micro theatre’ environment that took audiences out of their everyday familiar spaces (such as the library) and transported them somewhere new. However, the set also needed to be able to play large theatres and small libraries. Therefore the set our designer came up with was cleverly able to contract or expand in size depending on the space it was in. This was possible due to the placement of the 3 sets of screens, and also the way the screens were built, so there was the possibility of having the full set with 3 sections comprising 4 screens each, or a reduced set with 3 sections comprising a total of 8 screens. There is a moment in the show that requires a minimum ceiling height of 3.5m, but as we knew we weren’t likely to achieve this in all the libraries we had rehearsed a workaround for this moment so if the height wasn’t achievable we could still perform the show. There were other interesting challenges, such as where to put a waiting audience without spoiling the ‘surprise’ elements of our show. In Matson, had it been raining, we might have been scuppered as the audience waited outside! In Gloucester, we had the opposite challenge of how to (politely) get rid of the audience at the end of the show to enable us to re-set. They were clearly enjoying chatting with partners about forthcoming initiatives and being in the democratic and public space of the library and therefore saw no need to leave. 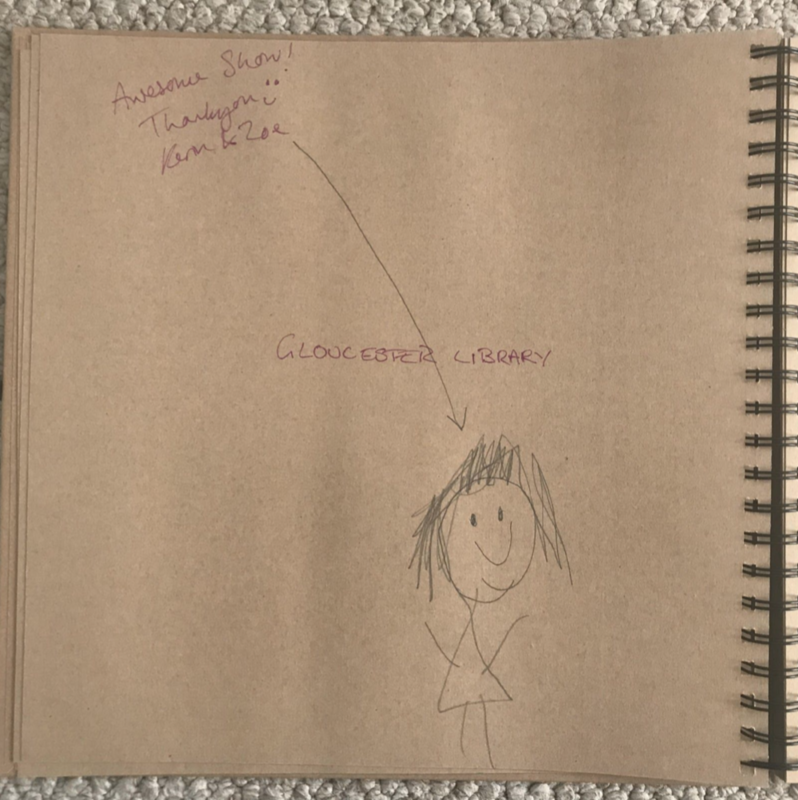 As part of our evaluation process, we used an audience comments book to capture any audience feedback (please see below). We were delighted by the response from our library audiences who embraced the themes and spirit of the show wholeheartedly. From the company perspective we found the partnership to be of real value on a number of levels. Working through Art of Libraries/Glos Libraries Service meant that we could reach more of Gloucestershire’s libraries – including Coleford, Tewkesbury, Moreton in Marsh and Dursley - through the open rehearsal, blog and libraries toolkit to which we are contributing. It meant that the promoting partners – Strike a Light, Create Gloucestershire & Gloucestershire Libraries - shared the financial risk and programmed more shows that would have been possible had we worked with just one of them. By working together we were able to reinforce each other’s work with the library staff, building their confidence and skills to say ‘yes’ to more performances in the future which, on the basis of our extremely positive experience, bodes really well for Gloucestershire. The challenge for a small company like Can’t Sit Still was the amount of capacity the partnership took: we liaised with 2 libraries, 1 sector support organisation (Create Gloucestershire) and 2 festivals (GL4/SaL) with, between them, 8 people to be in contact with. We would usually expect to deal with 1 key contact per venue. We wrote a well thought through partnership agreement together. This was really worthwhile, flagging up potential issues well before they arose and prompted useful discussion. However, the work on the ground was significant to ensure that the partnership agreement was embedded and that everyone had the information they needed. In the future, establishing who the lead partner was would have helped, as well as having clarity about communication routes/reducing the number of people involved. The success of the open rehearsal day was thanks to the partnership. Without this foundation we believe it would have been difficult to replicate a similar experience, particularly if the company (us) had to be the driving force in making it happen. The partnership work with Art of Libraries and Strike a Light meant that library and festival staff all prioritised attending the open rehearsal – something we know can be difficult in busy organisations. The commissioning arrangement also helped us to resource the open rehearsal day. We appreciate that without this extra money it can often be difficult to travel to other rehearsal venues (even if they are offered for free) as it means extra time and expense during a creation process. The library staff have been fantastic to work with and very open to trying things differently. It’s crucial to recognise their expertise in understanding the library space and dynamics of its use. The way library space can be used will be different to a theatre space, and a company’s expectations need to adjust accordingly. Establishing open, trusting communication with the libraries is really important. It may not be enough to rely solely on the programming partners to do all the communication for you. A partnership agreement, rather than solely a performance contract, can be a brilliant tool to set out how and why you want to work together. Libraries might have hard floors, not the nice sprung or padded ones companies may be more used to! We need to notice and explain ‘jargon’ used by arts companies and organisations when communicating with library staff. Library teams may not necessarily know what a ‘box office’ entails, what a ‘pre-set’ might be, what a ‘green room’ is or what a dressing room needs to have in it. Our understanding of layout requirements and measurement of a space may be different. We were lucky to be able to visit these venues, negotiate movement of library furniture, confirm the measurements we needed and overcome any problems. It might not always be possible to visit a library in advance, so photos and good communications will be required. We will continue to work with our library colleagues to bring shows to people in unexpected places. 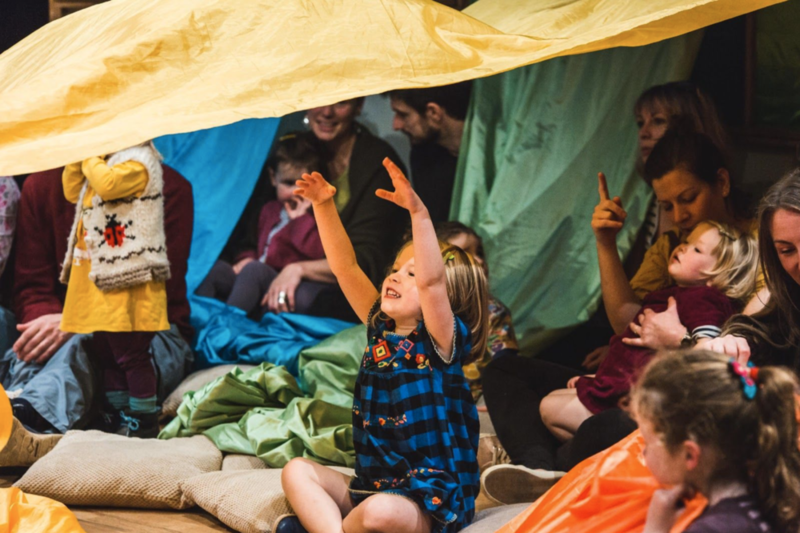 Our work in Gloucestershire proved our assertion that libraries can be an exciting place to perform, bring in a completely different audience for our shows and build positive relationships with the library sector who may be interested in programming our work in the future. Thank you to our partners Create Gloucestershire, Strike A Light, Gloucestershire Libraries Service and GL4 Festival for having us!